IZZY CRANES cc offers an excellent service at reasonable prices, not only providing crane hire at value for your money on daily rates, but also forklifts, generators, pump and many more at great prices. We are subagent of Cranelink Zoomlion Pty Ltd in Namibia. 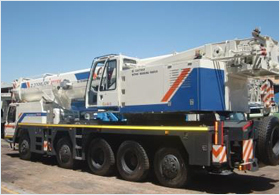 We supply Mobile truck cranes, Rough Terrain Cranes, Crawler Cranes and All Terrain Cranes. 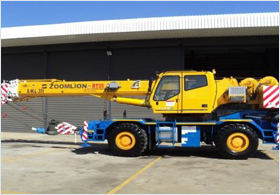 All Zoomlion cranes come with full factory warranty support that has both technical factory support and warranty spare parts held in Namibia. We have new and used stock. Izzy Cranes cc has also a team of highly trained technicians whom have mobile service vans that can respond to your immediate service response. We offers the highest levels of service at all times and we request that you book your service requirements in advance to ensure that we have the staff available for the day you require the work to be completed. Zoomlion is one of the top 6 largest equipment manufacturers in the world and has the largest crawler crane factory in the world. The product boasts the highest quality standards at the most cost effective prices. Our Safety Equiment Range is growing in product range monthly. We carry stock of black and yellow outrigger pads, infrared camera systems, protective glasses, hard hats, safety harnesses, chock blocks, wireless wind meters, outrigger pads and LED beacon lights. We sell a good range of equipment and accessories for building and maintenance. We're open when you need us, and if there is anything you require that we haven't got in stock, then we can order it for you and delivery it without delay.